added max 4 times (once a minute) to sumerror ? - It took from 22:42 until 1:50 until I part starts. slow and I param is to low. What is your P, P3, I factors ? 2) again, what is P, P3, I ? 3) normaly it my valve it take 12-24 hours to find sumerror (I impact). - How can we prevent 2 ? Maybe a feature to "live-control" the valve would be nice. protection to not move valve to hard limits. the min and max values? Jiri just did some redesign on that, but I think NO. Jiri - do you simulate your PI ? Do you have an .xls maybe ?? simulation in the Excel sheet ?? found Version 0.2.4.23954 posted on page 2 ?? The only thing, that bothers me a bit is, that I had to install .NET35. generally you have anyway several versions on your PC. promise to program that one of these days. @Karim: Would be nice ! Put your tool into trunk !!! gradient of the real temp changes to the wanted direction ? heating source like a PC is started ... waht do xou suggest ? ... how are you doing it ? integer value ? Why not put valve*10 to display and COM ? valve still in position and you have permanent offset ? errors and big for big. to use longer temperature history than only previous. leads to a unnecessary high I part ? small offset to wanted temperature (ex 0.5-1 degree). ad6) what would be the max for P3 before oscillation will start ? 6a) why one doesnt use P^4 /5 then ? - temperature change must have same orientation like valve change in near history. Otherwise integrator is not updated. that credit was already=0 at this time ?! Thanks for  last2AbsError=>lastAbsError order problem. Fixed. condition. This is exactly condition which must be "pay" from credit. Otherwise we will see windup again. on one valve since 2 day (since 321) I very often get E3 after flahing. installation, the error is gone ... any idea ??? 6a) why one doesnt use P^4 ^5 instead of p^3 ? Whats happen when sun shine directly into room? Temperature will grow. This mean, that error grows. In this case (absErr>last2AbsError) is true independently to valve. You will integrate this error typicaly 2-3 hours and result is too low unreal value of integrator. Name for this is windup. You have wanted 21, real 21 and you will change wanted to 18. 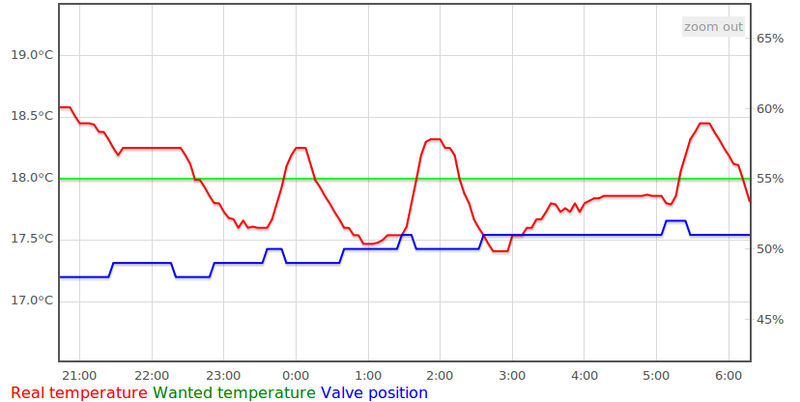 Valve will closed to valve_min and temperature descends 0.3 degree/hour. When temperature drop to 19 (just example) valve will compensate temperature drop. But it unblock integrator limitation. Condition from example2 is true therefore integrator drops down, it will move valve back to limitation. And temperature descents more, therefore valve will compensate .... and cycle repeats. Result is unreal value of integrator, again. Both example situations are from real life. part too. Tomorrow we will see if that helped. temperatures up to 80 celcius. up to 19 celcius because the vent does not close fast enough. as soon real temperature crosses wanted temperature? controller same as in 1.0 over year, without problem. Do you have explanation for this E3 phenomenon ? On one valve since 2 day (since 321) I always get E3 after flashing when reinstalling it. have integrator more close to reality. 1 but how come that ADJ 1 then sometimes stays longer in the display ?? heaters/valves and seems to be a software prob. should move to its 1st position. wheel). E3 is still there. A. It looks like theese E3 only occure, when the valve wants to start. C. The force needed to move the valve on this heater seems to be higher. 1. Is there a timeout after motor_start that can leed to E3? 3. Can we give the motor more torque (boost) during start up ? 2) no, it not detect torque_limit. It detect stop or slow down. - what do you think could cause the prob ? - what steps should I try next ? - what about 5. ? more than year for me without problem. Jiri THX for your hints !!!!!!!!!!!!!!!!! We have enough time to calculate the bat average after boot. how come, that we have wrong voltage calculation then ? - accu=2,4V!! - same procedure, WORKS OK, motor as fast as at 2,8 ??????????? - I took accu out for abot 10min. - AD1, E3, motor was quite slow when it tried to start  ??????? - I took accu out for about 10min. - same procedure, WORKS OK, motor faster ??????? EEPROM (EEsave fuse is set). - Are there any parameters stored in EEprom until calibration is done ? - Are there any variables not initialised, that may stay in RAM ? Jiri: I dont understand the connection to the prob from my last post ??? - Maybe 1 pulse is to short that motor reaches sensible speed ... ? described in my post ? motor does not start ... what should I try next ?? solution for the e3 problem. I also changed batterys. I'm now trying with lower and higher values for 14. It only happens at one radiator, so I think it's moving to heavy. my own systen to readout the serial data from the rondostats). batteries and I'm also reading too high voltages. I do not provide any external power to the rondostates. Maybe they changed something with the hardware? 1. Chris do you have the wrong voltage reading all the time ? exchange the motorunit, but the error stayed ! from amazon last month ... did you find a fabrication date somewhere ? where E3 comes from ! Most times I get E34. of motor pulses ignored on start to control speed. Richard G: battery voltage measurement is one of oldest part of code. where is problem, it can be useful for others. ago. It did not help. something to with the adc or something is wrong with pcb. we dont drive to far ? THX, so no noise canceling for bat. nice, it is definitely compensation to wrong battery voltage. I remember correct that you have Dragon? If yes, try it manualy. before real or use code like for thermometer. I repeated accu out/in noe several times and sometimes V is OK.
Jiri why did you or the others implement this bat compensation ? What about 1 & 2 from last post ??? Battery voltage on LCD can be enabled on rev 330. Good guy - THX !!!!!!!!!!!!! Reason for battery voltage compensation was external power. power it works, but motor is too strong on start. can remove it or create option for this. do with my change !!??? why temp is set to AUTO when pressing AUTO in this menue (sometimes) ? 2. integratorBlock=6; means blocking for 6x4 minutes ? sticking in this source code !!! flash the rondostates right now. shows 3,34V is aprox. at 2,8V too in reality. a short circuit between vcc and ground, so the rondostat did a reset. which is <=3,55V. And: The rondostat sowed e3 after the reset. which is >=3,55V. And: The rondostat showed e3 after the reset. Out of 4 rondostates, only one showed a voltage of 2,8V as expected. The one with 4,4V shows E3. functionality need only MCU and capacitor on VREF pin. behaves like this. Chris, when wiil you programm new code ?? use the EEprom edit mechanisem some how ?? CTL_interatorCredit, reason is missing support for decimal numbers<0. Jiri did you accept 1 & 2 ???!!! How can I achieve 3 ?? impedance inputs, no pullups and so on. batt voltage show only 2. ? For me it is correct, show 2.55. I change battery voltage in LCD back to mV without decimal point. men you are fast THX "mV"
add to your sumErr log (4): I down know why, it looks strange. // TODO: improve this code! 6 .. then is saturday and not sunday as stated in comment ??? So the voltage messurment seems to work. automatically when voltage rises, or only at reset or button-event? Serial Output reports a voltage of 3,06V now. Power-Supply is set to 3,0V. while real voltage was 2,8V. I set power supply to 2,8V now. Serial reports 2,87V now. I set power supplay to 3,5V, serial reports 3,5V. is 2,8V. Still shows batt. speed seems to be lower and when it starts the boost is barely there. still shows 3,55V or greater. droped below 2,4 bat warning comes on. Low bat is 2.0. - I fix "char" problem on voltage on LCD. c) did you find anything in my log ? on your sources and it will kept after "svn update" command. what happen at this time? or to cold at 10:00. I think giving credit is good enough !! !!! VERY VERY  WELL DONE !!! will prevent growth of sumerror anyway. overheating in the morning. Here it is. reset and not before with the same rondostat? Strange. I got my jtag programmer back and flashed rev 344 (without rfm12). Bat on lcd shows 3281, multimeter shows 2,89V. Csn I use rev 344 as "productive" version, or won't it work? overheating problem in the morning which is in all rooms). You have externaly disabled heating and SW wan't to fix this error. situation (I will improve it later). Chris, I have idea how to solve your problem. Please wait till tomorrow. be solved on Rev345. It need tests. Jiri add this to com.c ?! change on integrator is reverted. same. Both expire. The 3rd function is revert (I think its a good idea). All 3 mechanisems have the same goal = prevent windup = right ? 2. When do I have to change I_ERR_WEIGHT and when I_Factor ? 2. When do I have to reduce I_ERR_WEIGHT and when increase I_Factor ? have been produced by external influece and will be stored "forever" ! during the first periode, where external influence is gone. b. expiration credit: do we relly need this ? Ex1: you want to heat more, but central heating is switched off. valve without reason again to valve_min. after 17 hours is caused by valve change? too strong. I will change it. (abs(lastTempChangeSumError)>=I_REVERT_ERR_TRESHOLD) <= tell me why? "When do I have to reduce I_ERR_WEIGHT and when increase I_Factor?" calc/excel sheet) and try press some "regression analysis" into code. But I am sure that end of heating season will be faster. idea a) and b) work togehter ! ad (abs(lastTempChangeSumError)>=I_REVERT_ERR_TRESHOLD) <= tell me why? impact ... and I part is OFF "forever". just revert sumerrors that have a real influence (e.g. >=1%) on valve. of my condition a) !!!!!!! my explanation was not quite OK.
ad b) when I say "I part eill start working" I mean this part ! Or I understood wrong. Any chart ? Actually I set Vmin = VheaterOFF - 4. This way I part cant "wind down". which usally are not more than 2. Valve calibration depend to battery because maximum force depend too. (if you need exact position of valve, try to find "manual calibration"
remove had from valve you must calibrate it anyway. the same like last time. So we can be sure everything is fine. is about 2% from 0x200 to 0x2d0 pulses on my valves. why dont we use old_result here ? PS: I set blocking to 3 to get faster results during testing phase. Heating was deactivatetd in the afternoon, because of sun ..
2a what do I have to change  to try it ? heating response it is fast enough. must also update LCD and COM functions for correct reports. It is interesting idea, I will test it too. 1. As heater heats up valve. the temp sensor is heated up via its wires. hr20_1354_110401a_thin_wire_blocking_I.jpg the impact on sensor is less. funtion. boost sets valve to max or min position depending on error. should look like that ???? Boost function after any change of "temp_wanted"
that measurement repeats many time and next second pulse come earlier. situation with (ring_used<AVERAGE_LEN) create this problem. switch (++state_ADC) ..... ++ here means increment before operation !! Battery voltage error fix was not complete. Updated. would it do that ??? to MAX and later back to MIN ???? still=0. This way the first calculated average will be wrong ??? Voltage on a long valve move ??? (0-14), ring_pos=ring_used=14. But ring_used will be incremented later. It is reason to compare with 14, not 15.
calibration on progress or calibration error before this. on a simple idea to handle it like the temp_ring_average !! use regression analysis to find unknown parameters on real time. 1. of course I am looking forward to your math model !! 2. ???? Where is problem ? a) I am curious why you used *2: Does <<1 not work with constants ? OK I clean up this code. = -982 = 0xFC2A And this position was not reach. This mean, that it can't be this error, or we have some bug in code. batteries out ... can this be a trace ?? OK. But what is E31? Any idea how I can reproduce the prob. ?? 0 not make any problem. Heating was OFF from 22:00-4:30..
#define I_ERR_TOLLERANCE_AROUND_0 15 // unit 0,01Â°C. Set it quite restrictive ! RE: "Can you generate "diff" file? (for ex in TortoiseSVN)"
b) I could also edit the changes into R363 files and send you those .. I am still here. But I am too busy on another tasks till end of may. -MMD -MP -MF"src/lcd.d" -MT"src/lcd.d" -c -o "src/lcd.o" "../src/lcd.c"
how can i fix this error(s)? transis: Which compiler? Please try WinAVR-20100110. it is already the compiler: WinAVR-20100110 ! : "r14", "r15", "r16", "r28","r29", "r30", "r31"
: "r14", "r15", "r16", "r30", "r31"
after this modification the compilaton will pass. What are the side-effects of this fix? registers and compiler will not know it. It will fail. are the compiling options wrong? the other optimization levels "-O1..3" the errors are not occured. Can someone explain me this crazy behavior? same options should report same errors...)? before code will be too big for only 16kB flash. > I am still here. But I am too busy on another tasks till end of may. has not time to rewrite it. have some urgent concern to solve. that the vent does not open, even if the room is too cold. 55-60%. (max vent position 96, min position 30). RFM12B for all (Rondostat-) slaves  (because it is specified for 3,3V). What frequency should be used: 433MHz vs. 868MHz? Thank you for some useful suggestions. 1140 on higher speed i receive no correct characters. @Frank: Thanks for patch I will try it later. flash space and in this case, every byte is needed. this year on different valve..
Then I took battery out and repeated from 3. No more error ! it could be because I used empty batteries. open detection, but it still triggers. if vents are at about 90%. So I increased the value for valve-center. only closes a little bit, which is not enough. I think I have to change impact of P-Part of the controller? temperature. Reading the valve state would be a plus. has gone to sleep.) I have not found a way to wake it up. I have not found a protocol specification for the SW 204 specifically. I actually open up the HR20 and solder some extra wires to it? hr20.bin to the HR20 using the AVR JTAG ICE. * Afterwards, I can use the OpenHR20 protocol to accomplish my goal. I see no .bin files inside the svn repo. correct application?) command line would be very helpful. - serial protocol for original SW 204 is unknown. - You are right ICSP can't be used without open valve and soldering. source directory simple start "make". I recommend do it in "rfmsrc"
directory and result hex files will be on "bin"
order. Without first is impossible rewrite EEPROM. update: for compile under linux you need "gcc-avr" and "avr-libc"
under the tree keys. The display can be easy removed from battery side. the new firmware can be flashd via serial cable. # Name of the Atmel defs file for the actual MCU. # files" and unzip it in the same directory as this Makefile. apply to fresh 363 revision. You probably made same mistake. Did anybody consider adding 1-wire connectivity yet? User interface would need the possibility to configure the address. I plan to implement this, but would like to hear your thoughts. I got the first HR20-E flashed with JTAG last night. I'm very impressed. >Did anybody consider adding 1-wire connectivity yet? I can upload my code tonight. difficult to merge this in the current branch. timetable is removed as this is now done by the central controller. jdobry-at-centrum-dot-cz and send me your account name from sourceforge. current code. Otherwise please create new branch in repository. have too much in common with the current version. from/to the onewire interface and gets the sleep mode disabled. only used in motor.c as otherwise the interrupt routine may be too slow. otherwise it is too slow to handle the onewire timing. add this to the code. need to run on 8MHz. the german parts ;-) ). try to integrate it with the current version and into the repository. more about the 1-wire-bootloader :-). details including pictures of the board. review and give comments before (hopefully) getting this in to svn? I made fast review and looks OK. Committed into revision 364.
because I can't test it. might make sense to replace the CPU and take the HR25 SW-version. replacing the JTAG pins on the side with ISP ones. plunge and purchased an HR20. started with for the HR20.